A series of workshops aiming to teach basic facts about the culture, history, geography, heritage and traditions of Poland and Central Europe will run in libraries in Dublin, Blancharstown, Cork and Limerick between October and December. The workshops for schools based on intercultural education guidelines are designed to expand the horizons and intercultural experiences of our youngest citizens. 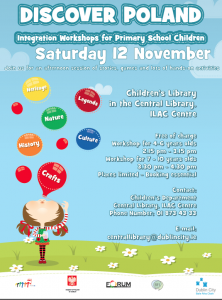 Children aged 5-12 will join facilitators Joanna Parkes, Donal Gallagher and Janusz Flakus for this special event which will be packed with wonderful stories and lots of fun, hands-on activities. The workshops are being conducted in conjunction with local schools. The project is organised by the Embassy of Poland in Dublin and Forum Polonia in collaboration with the Bishopstown Library (Cork), Blackpool Library (Cork), the Limerick City Library (Limerick), the Blancharstown Library (Dublin) and the Ilac Centre Library (Dublin). It is also supported by Bilingual Forum Ireland. The initiative aims to celebrate the Polish Presidency of the EU Council. –Educate young people about Polish geography, climate and culture eg.